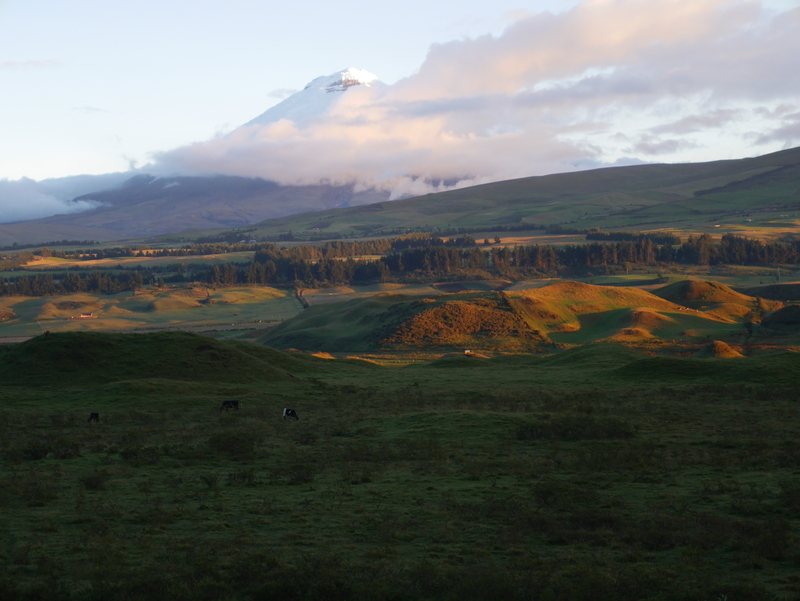 I’ve been staring at this Volcano for six months, driving back and forth through Ecuador, it’s not hard to spot. Cotopaxi is the second highest active volcano in the world, it towers majestically and threateningly over the Ecuadorian landscape, and for some reason I just felt drawn to it. I have had this inexplicable obsession with climbing to the summit. Of standing on top of Ecuador’s most famous volcano, and staring out into the land that since November has completely and utterly stolen my heart . It’s hard to say what drives someone to want to conquer a mountain, is it pride, stubbornness, stupidity or something else? Why does it feel so innately primal to reach the highest point possible and stare at the world from above? For that short second all the pain and anguish of getting there disappears you’re high on more than the altitude. You’ve beaten the mountain and your reward is to peer for the briefest of moments at the beauty in this world. All the magnificence that surrounds you comes rushing towards your eyes, greater than the sum of their parts. You look, as the giant you stand on does at the world, and you see what it must be like to be something more than human, it is a transcendent experience. 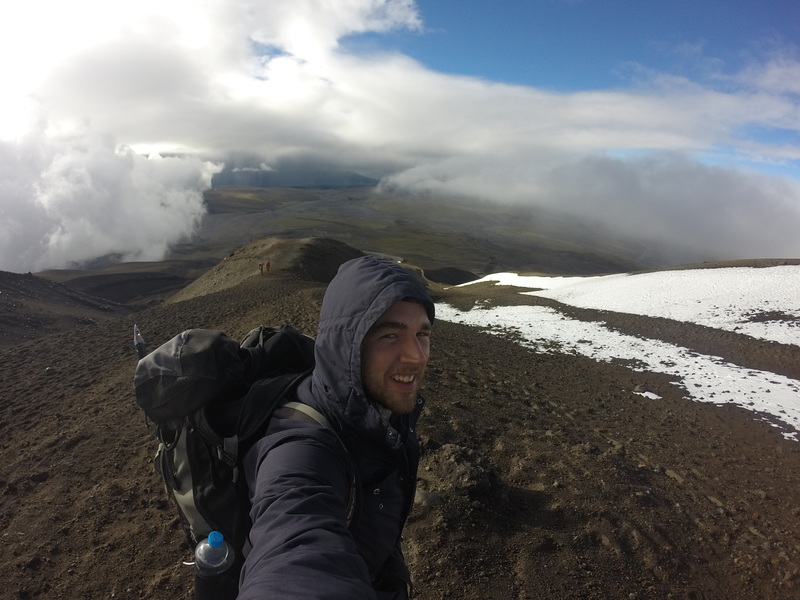 My journey to climb Cotopaxi took me all throughout the Ecuadorian country side, hiking through rural villages, asking every man, woman and tour operator how I could make it to the top. I eventually ended up in Latacunga where I finally organised my trip to the summit, as far as I can tell, given its location, Latacunga is the easiest, cheapest and most reputable town to organise a trip to Cotopaxi. It’s proximity to both Cotopaxi and Quilotoa, make it a perfect base for altitude training, and resting before the big climb. Our climbing party consisted of an enthusiastic Swiss girl, an accomplished Ecuadorian mountaineer, who would be our guide, and myself. It was a small team but with less people there was less chance of having to turn back, if one person couldn’t make it, none of us could. 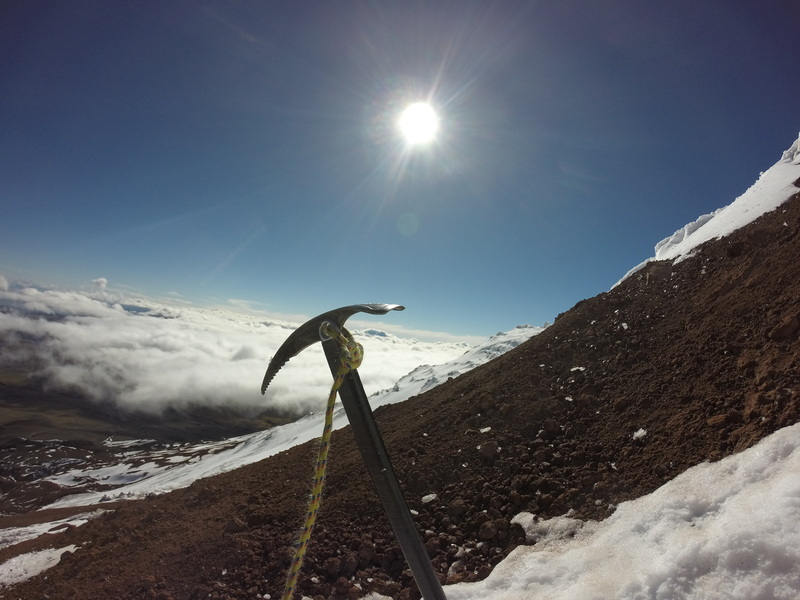 After putting so much into this adventure, coupled with the huge rise in volcanic activity in the volcano, my window of opportunity was incredibly small, I only had one shot at climbing to Cotopaxi’s summit. 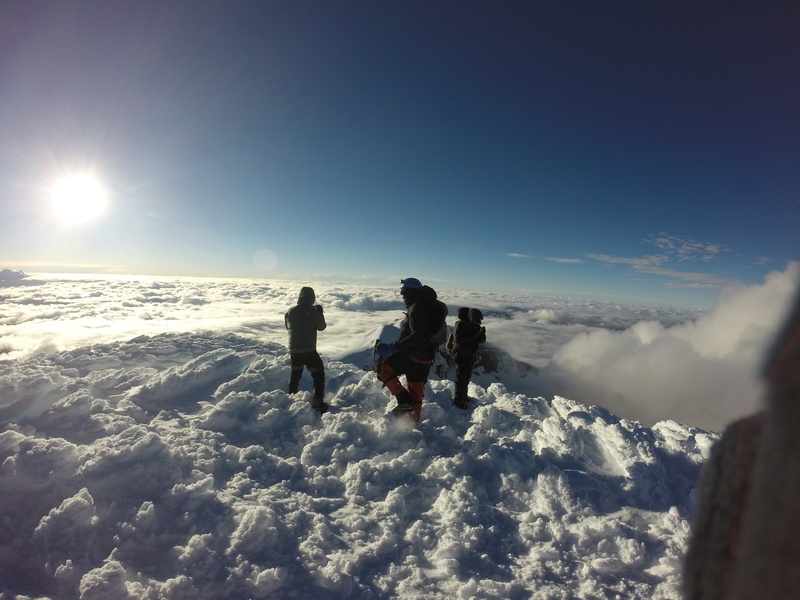 They say only 50% of the people who attempt Cotopaxi ever reach the top, I was nervous but I had spent four days acclimatising by hiking around the Quilotoa region and I felt confident physically. I did not know how I would do mentally, on the potentially seven hour climb and three hour descent, but I was as ready as I could be. 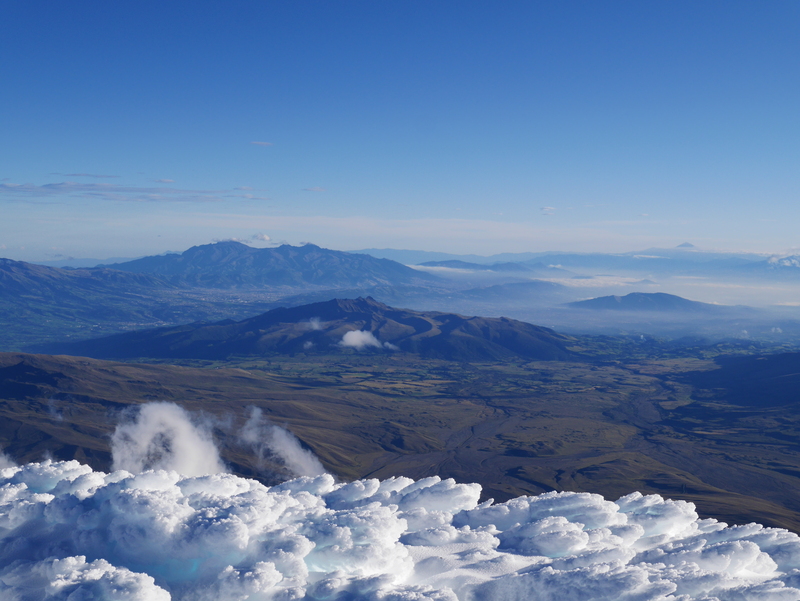 We left Latacunga around midday to head for Cotopaxi National Park, I could see the volcano in the distance, like I’d seen it a hundred times before, its peak hiding above the clouds as it dwarfed everything around it. My heart had already begun to race, we made small talk in the car, but I could tell all anyone could really think about was the climb. We arrived at the volcano and made the short, and by this point relatively painless hike up to the refuge at around 4800m (16,000ft). We nodded at the eight or so others already there, who would also be attempting the climb that night. After a crash course in ice pick climbing and hiking we headed back inside to prepare our gear, eat some food and attempt to get some sleep. At 11:00pm the lights were turned on and we all silently got out of our sleeping bags, and started putting on each layer. We trudged out, feeling much heavier than before, to a small breakfast and one last run through of the night’s adventure. By 12:00am we were ready, as the door opened from the refuge I could feel the fierce icy wind rush over my entire body, its cold touch already clawing its way into my bones. It was freezing, but the night sky was clear, as I looked up I could see the Milky Way sparkling above, strangely I did not feel nervous. I felt ready. We turned our head lamps on and began the hike to the glacier. 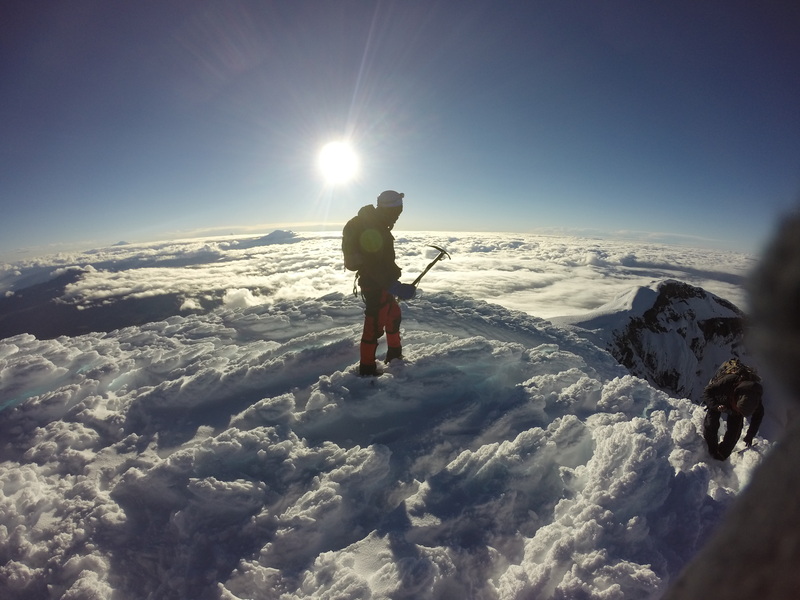 We had seven to seven and half hours to make it to the top, before the sun rose and started to melt the ice, causing avalanches and making it far too dangerous to traverse. We made it to the glacier with no troubles, I could definitely feel the altitude but I was still feeling confident. We put on our crampons, secured our ice picks and attached a rope to all three of us in case one of us fell. The ascent was brutal climbing up 70-80 degree banks of snow and ice, digging our ice picks into the ground and tediously making the slow climb up. About an hour in the Swiss girls was having trouble with her asthma, gasping for air, we were all tired but I felt we could still make it to the summit before sunrise. An hour later we were all exhausted and my climbing partner’s asthma was getting worse, we could only climb for thirty seconds before needing a minute long break to recover. Still we went on. About three hours into the climb I began to smell sulphur, I didn’t think much of it, but as we climbed higher the air became thicker with it and my throat was starting to hurt. Gasping myself, I tried to comfort my friend who could barely stand while she recovered from another fit of coughing, this was the point where the first signs of doubt crept into my mind. We were stopping more frequently and taking longer to recover, all I could think about was lying down and going to sleep, but I knew that would mean certain death up in the sulphur and the cold. I seriously toyed with the idea of giving up, but I knew I had to keep going, I couldn’t let everyone down. As we climbed higher the sulphur was really affecting me, I was sleepy, my vision was blurry and my nose and throat were stinging. The rain mixing with the sulphur turned acidic and burnt my eyes, and my stomach was turning from a mixture of the high altitude and inhaling so much sulphur. My guide kept asking if I was ok, if my vision was affected, I kept lying and telling him I was fine, I didn’t want to give him a reason to send me back down the mountain. I was, however, getting worried, I could barely keep my eyes open and when I did, they burnt. I didn’t know if I would pass out before I got to the top or not. As I looked up to the night sky a huge fire ball burnt across the sky, the brightest shooting seemed as if painted on the back drop of the Milky Way. The beauty distracted me from the pain, and from then on whenever I thought I couldn’t make it, the stars were the only thing that kept me going. I don’t know how we did it, but we battled on for two more hours, I can barely remember any of it, until I could see the sun begin to rise. We were about 100m from the summit when we saw it but by then we were moving so slowly it would still take us almost an hour to reach the top. With the goal so close all I could do was smile, my body was numb, I couldn’t move or feel my toes but I had a sudden hit of adrenalin. The rope holding me to my friends was realised and I tried to sprint to the last 90 degree ice wall, but was overcome by exhaustion after only a few steps. I fought all the way to the top running and falling up the last peak, until finally, I made it. There I stood 5897m (19347ft) above the world, out of breath, aching and dizzy the only thing keeping me upright was willpower. It was so surreal, my time at the top was a daze, a desperate mess of hugs, celebrations, camera flashes, stumbling and panting on the ground. 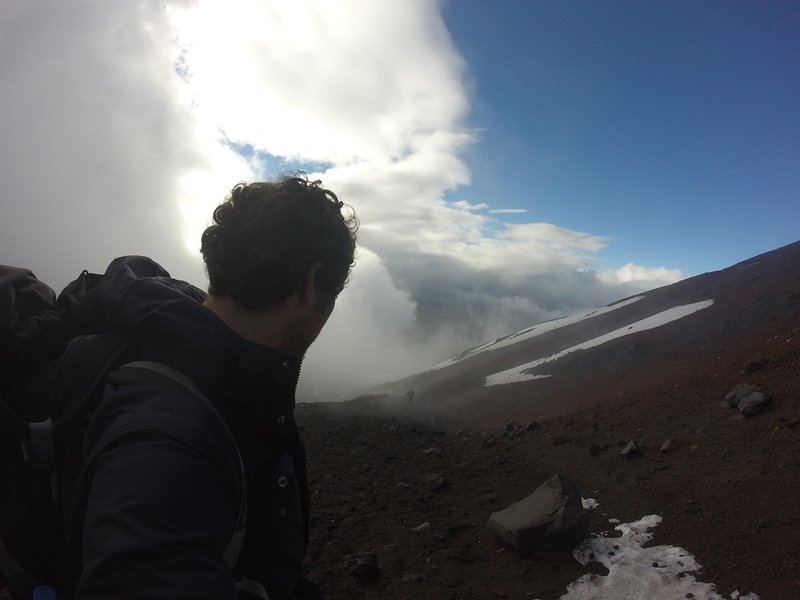 The descent was almost just as hard, the feeling had returned to my now unfrozen feet, only to reveal unbearable blisters as I stumbled down the volcano. We staggered down the steep sloops, taking in the beauty of the ice but far too weary to stop for photos. It took us three more gruelling hours to the refuge. I didn’t have enough time, to think about what I had just achieved, all that was on my mind was my now throbbing feet, my wheezy lungs and going to sleep. I can’t describe the feeling when I finally awoke the following morning, bruised and battered. An enormous smile was plastered across my face, all I could say to myself the entire day was “we did it, we actually did it” it didn’t even seem real. 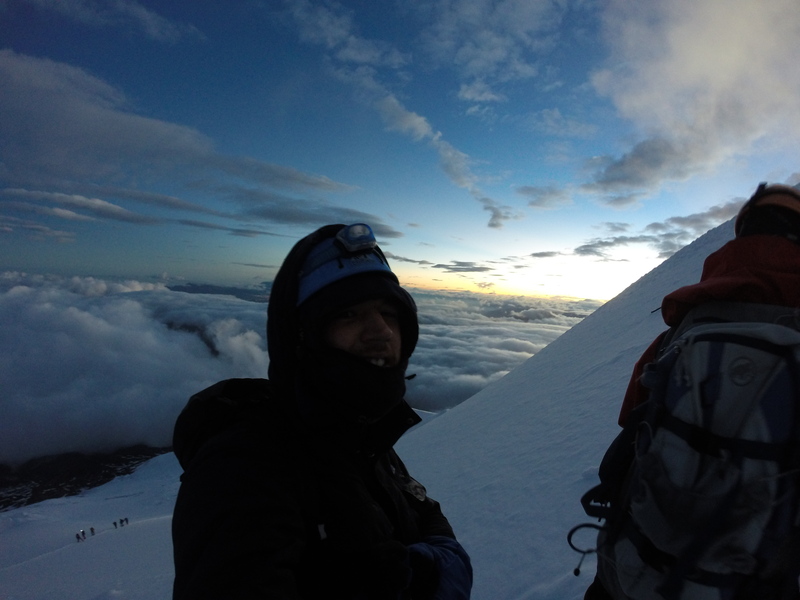 The culmination of, months of research, training, and dreaming had paid off, I had conquered Cotopaxi. I still don’t know what drove me to climb to the summit but it undeniably impacted my life in such a profound way. I tested myself in the most extreme way possible, and I made it. I set a goal and I achieved it. Living the metaphor of climbing that mountain gave me such an appreciation of what we as human beings are capable of, of what I am capable of. The pain i felt confirmed the old adage that nothing worthwhile is ever easy. It is when you are uncomfortable, when nothing is certain, when you are lost, that you truly know who you are, that you can truly grow. I appreciate the comforts of home, and certainty it brings me, but I live for getting lost. I wonder if it’s cliché to say I found myself on top of that mountain? I don’t care, I discovered things about myself, about the human condition 5897m in the sky. I really believe if you trust in yourself enough, have faith in the fact that just being alive is incredible, there is no mountain too high to climb. 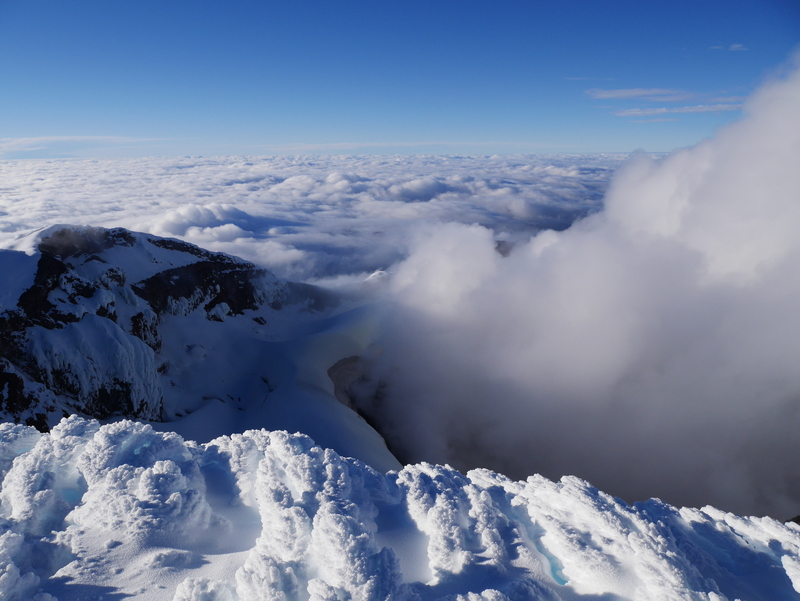 Awesome photos, from the summit with the snow formations it looks as though you are climbing clouds. Great blog post, very motivating, just what I needed to read. Incredible. Thank you for sharing, your photos are amazing and again I was gripped by your story! How was the Swiss girl with her asthma? Thank you! sorry for the late reply, the Swiss girl recovered fine and she was glad she did it. When was your trip? We are preparing for a climb there the first week of July- very helpful to read your account! The sulphur sounds a little daunting. Hey, I climbed it mid June, hopefully all is still well on the volcano its getting pretty active!